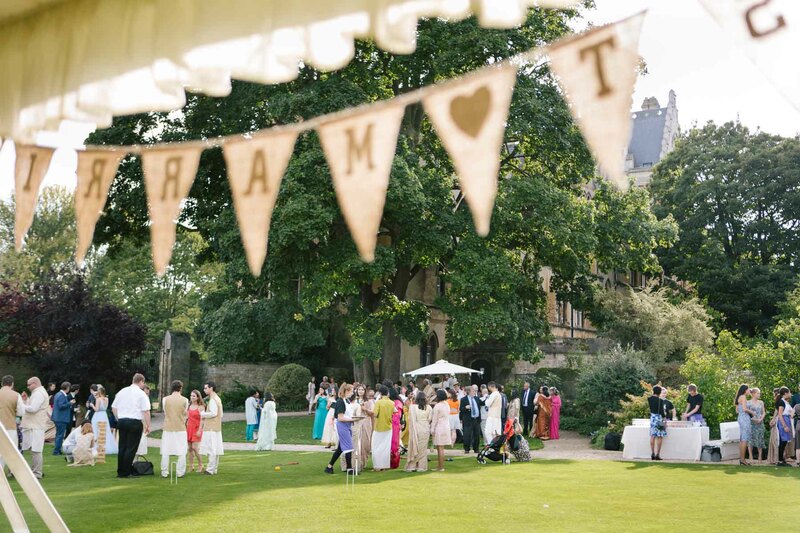 Priya and Lionel brought a touch of Indian majesty to their international wedding at Christchurch College. India and its culture holds a special place in my heart (find out more about this here) and I am so in love with these images. The jewel tones of their outfits manages to transform the stones of this most quintessentially English of venues into something a lot more exotic. Look at that image above – we could be in a temple on the other side of the world from Oxford and its dreaming spires! The couple celebrated their marriage with a traditional Indian catholic ceremony in Christchurch cathedral. 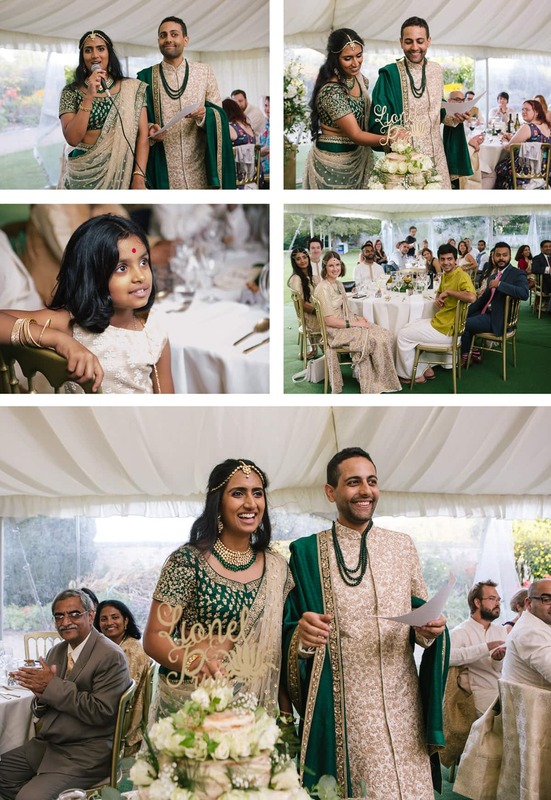 As well as the exchanging of rings, Priya and Lionel’s ceremony incorporated the ceremonial tying of a thaali necklace around Priya’s neck, and the gentle placement of a sari on her head by her new husband. It was emotional to watch, and powerful to experience in such a spectacular location. Then it was on to the reception. 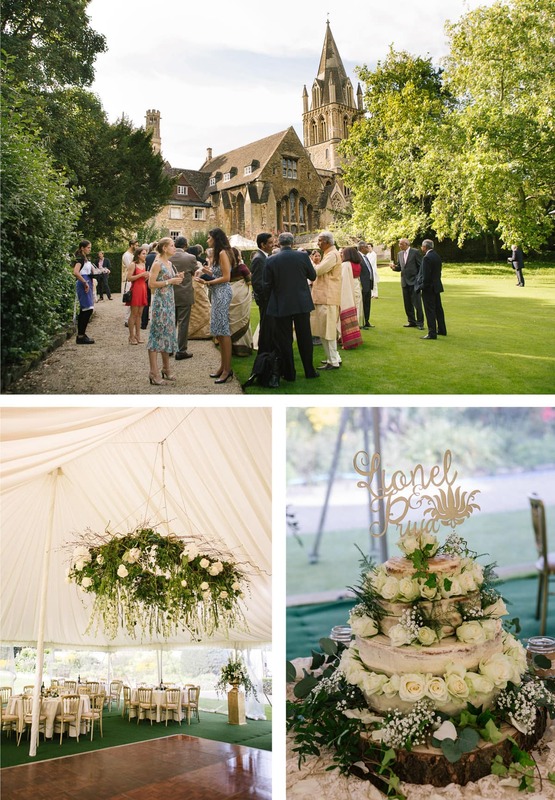 Their marquee was decorated in beautifully sculptural flowers with lots of lovely trailing foliage, and after a delicious meal, guests were able to visit the amazing chocolate bar – including handmade chocolates from a friend of the couple. Delicious! I love all the images from Priya and Lionel’s international wedding, but I have to say the group shots are some of my favourites. I love the compositions we used outside the cathedral, and that green just pops beautifully against the sunlit stonework. The finished images are striking and artistic, and I think some of my favourites from the whole year! Check out the favourites gallery below (good grief it was tough to cut this one down!). If you’re planning a wedding with some international flair, whether in Oxford, London, Kerala or Timbuktu, get in touch and let’s chat about your photography. I’d love to hear about what you’ve got planned. I just wanted to say this is an excellent wedding blog!